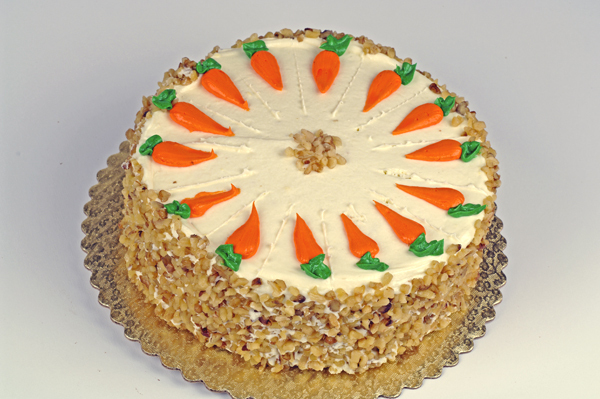 Carrot cake is by far one of my favorite desserts. The name, however healthy it sounds, is deceiving considering a slice of carrot cake packs 300 calories, 16 grams of fat and 27 grams of sugar. You’d be able to eat 5 1/2 cups of chopped carrots for those calories! So why is carrot cake so calorie dense? There are two things to blame. The cream cheese frosting and the 1 1/2 cups of oil used in the batter. But there is a better way. Instead of using full fat cream cheese in the frosting, switch to 1/3 less fat neufchatel. Cut down the butter called for too by half. When it comes to the batter, substitute all but a 1/4 cup of the oil with a mix of sugar-free applesauce and plain, low-fat yogurt. Another trick…instead of making a layer cake (which requires a lot of frosting), bake the cake in a square cake pan and just frost the top. I had a cake that followed this recipe this weekend and let me tell you I didn’t think it was a low-fat cake at all! And when I found out it was, you know I helped myself to another piece! This entry was posted on September 8, 2010 at 8:19 am and is filed under Snack Wars. You can follow any responses to this entry through the RSS 2.0 feed. You can leave a response, or trackback from your own site.